Via The Power of Media Blog. Click image to visit. Finally, discuss the use of social media and Web 2.o principles, including Twitter, to not merely access information, but engage in critique, debate, and discussion. In the beginning, Al Gore created the internet. And, that internet was very much like navigating our highway system. You merged on, with or without a map, and started exploring. You searched, found, and read relatively stagnant content published by others. If there was a website you enjoyed you added it to your bookmarks folder. Then you had to visit the website regularly to check for updated content. 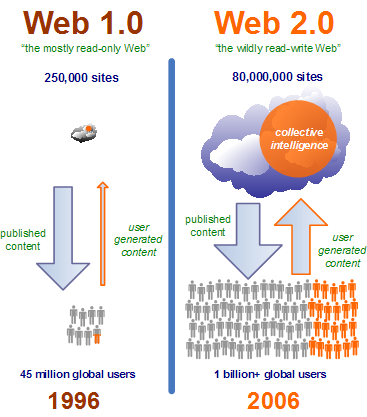 That is Web 1.0. With the rise of blogs, Facebook, and now Twitter, users are not just recipients of content. Now, users can edit content (i.e. commenting on a blog or news article) and create content (i.e. Facebook and Twitter). This is Web 2.0: User generated content. Engaging, critiquing, editing, adding, and publishing content in real time! RSS stands for Real Simple Syndication. RSS is a specialized URL (usually ends in .xml) that feeds information from a website to an RSS Reader. It is a way to receive information from a website without actually visiting that website. For example, a podcast is a type of RSS feed that has an audio file at the center of each new post. Research journals and blogs all usually have RSS feeds. An RSS Reader, or Aggregator, is a software program that collects and displays information pushed from RSS links/feeds. A reader is similar to an e-mail inbox, except this is an inbox for the internet! No more bookmarking or remembering [forgetting] to visit different websites, journals, blogs, and online resources. The RSS Feed pushes new information to your RSS Reader allowing YOU to stay automatically updated on any new content from a blog, research journal, website, or even a PubMed search. Journals, blogs, websites (like ESPN), and most online resources now have RSS feeds. There are browser-based readers and desktop based readers. Many readers also feature mobile apps, allowing you to access your RSS Reader Information on your smartphone. I utilize Google Reader, but of course there are other options. RSS Feeds and Readers save time and energy by pushing information directly to you. You then decide what to skim, what to skip, what to read later, and what to read now. There is absolutely no way you could access the same amount of information by surfing the net and bookmarking. RSS allows you to organize an inbox for the internet which broadens not only the volume, but the perspective of information you engage, share, and participate in. The scope of information pushed to you is limited only by your imagination. Plus, you only have to add an RSS to your reader once! That is the basics regarding RSS. Hopefully, if you are not already utilizing RSS this outlined some of the advantages. The next post in the series will detail how to set up Google Reader. Thank you so much! I’m so excited to use this and save myself soooooo much time. I also wanted to know if there were specific blogs you may recommend regarding PT? @Jennifer: In my next post I will list and review a handful of blogs. Some apply generally to PT, others are more manual therapy/outpatient/sports related. Thanks again. Loved the article/info on journals and blogs. Not being as computer savy as you all and just starting to use google reader, I am trying to figure out how to save articles, abstracts, or blog posts in folders through google reader? I can’t seem to figure it out. I tried evernote, but that didn’t seem appropriate. Suggestions on how to do this or website to refer to? Or maybe MP could add that info in his next leveraging technology post???? Thanks again for bringing me into the new ages.